Last week was an extremely stressfull work week for me. This is a quick sketch I did during a meeting to express my frustration. 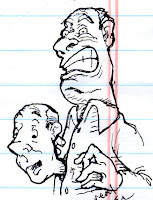 I am the man in pain and a co-worker is the chest-popping-head. ha! This is great! I really like all the illustrations I'm seeing on your blog. Very nice - a great expressive illustration. Well done. Very nice drawing! Like the giraffes too.. Your work is funny and fresh!